You should always be positive of your identification. Do your homework. New foragers who are unfamiliar with plants might mistake a poisonous plant for an edible one. For example, poison hemlock and water hemlock are deadly, and resemble other edible plants in the same carrot family. Accurate plant and mushroom identification is essential. 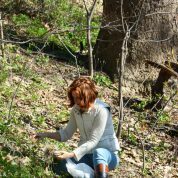 If you have no previous plant identification experience, take classes with an experienced forager (or ask your grandmother! ), buy good field guides and books, cross reference your tentative ID with plant identification groups on Facebook and reputable websites. Be cautious and be disciplined. Learn the botanical names of plants, not just the common names, as they are variable and change from region to region – botanical Latin can be fun and will actually tell you something about the plant. If you are learning mushrooms, join a local mycological society, and stick to collecting mushrooms with pores, like boletes, rather than mushrooms with gills. Mistakes can be fatal. No matter the season, there is always something to forage if you know the plants. Spring is obviously a time of great abundance in terms of young greens, edible tender shoots, and flowers. But even winter provides fragrant twigs and seeds and can give you clues about where to look for edible plants in the spring. Pickling, fermenting, infusing and preserving in aromatic salts and sugars are wonderful ways to capture flavors and extend a season. I make vermouth throughout the year in different seasons. You should always be respectful. This means being informed. The more people who forage, the more pressure is put on a system. For this reason I prefer to concentrate on invasive edible plants in my region and I also advocate the cultivation of plants that are vulnerable or native, so we do not have to collect them from sensitive wild areas. Only collect a small percentage of what is available, unless it is a highly invasive plant like Japanese knotweed. Then you can mow it down! Don’t break pieces off plants; make a clean cut with a sharp knife. Keep tender shoots or leaves from forages like wild onions with soil on them in small paper bags. The trick to successful foraging is patience and time, attention to your surroundings and pattern recognition.